Austria-based Loxone is taking on the U.S. custom integration market with its affordable smart home solution that minimizes the need for an interface. The company, which touts itself as the biggest home automation control system in Europe with more than 70,000 homes worldwide, has planted its U.S. roots with the construction of a new 7,500-square-foot smart home in Media, Pennsylvania, just north of Philadelphia. 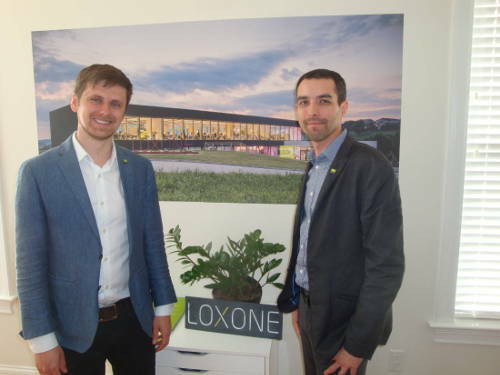 Loxone was started in 2009 by co-founders Thomas Moser and Martin Oller with the goal of making an affordable smart home technology that was not dependent on a smartphone as the interface. Loxone built a smart home in Austria several years back with much success. In 2013, the company spread its wings to the U.S., opening an office in Lexington, Kentucky (Literally the old offices of Elan Corp. prior to its acquisition by Nortek.). Today, the company has 250 employees worldwide. foot in the door for integrators with builders. It wasn’t until 2015 that the company decided to seriously target the U.S. market, according to Woess. In 2016, the company couldn’t find a suitable combination commercial office/showroom space so it decided to build the smart home in Media, selecting the area due to its proximity to New York City and Philadelphia, along with weighing the affordability of the area. The demo home is not a mansion by any means, but a normal two-story, five-bedroom home. Loxone’s authorized U.S. dealers receive one to two hours of remote training, and a three-day hands-on training for its Silver Partner integrators. According to Woess, about 60 percent of its authorized dealers emerged from the residential channel, with 20 percent coming from electrical and 20 percent from the IT world. In all, the showcase home features 24 zones of audio, all lights, HVAC dampers, interfaces and more. According to Mark Skazenski, director of sales, the entire system has an MSRP of $33,000. For builders, that cost includes all the lighting run on Cat 7 cable. “If the Internet was to go down, this smart home would still operate as normal." “Lighting control and lighting design are the foot in the door for integrators with builders by using Loxone. Builders can subtract 30 percent of the cost of fixtures and lighting circuitry,” says Skazenski, who admits the specific savings are hard to determine because of the variable cost of fixtures. Also unique versus other smart home automation systems, the Loxone ecosystem can be configured to not be connected to the Internet at all. “If the Internet was to go down, this smart home would still operate as normal,” says Skazenski. With no cloud control dependency, it also means the home is safer from cyberattacks, he notes. The demo home is flooded with sensors to detect movement in the room, as well as ambient light levels. Lights automatically turn on or off based on motion or lack of natural light. 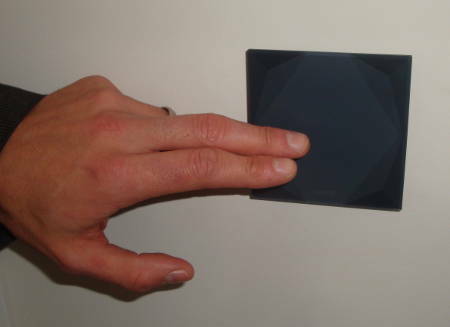 Loxone’s interface is called the Loxone Touch Tree (wired version via Cat 7) or Loxone Touch Air (wireless RF via a proprietary mesh-network ) and it looks like a glass 4x4-inch tile placed on the wall. There is no engraving. Controls are activated by touching the center or particular corners of the interface, as well as the number of touches. For example, touching the center turns on the lights. Double tapping the right side of the Loxone Touch activates the multiroom audio, and then the upper and lower right-side corners control volume up or down. Similar commands control light levels and colors, as well as motorized shades. The interface also has a built-in temperature and humidity sensor. “You will not find a thermostat in this home,” remarks Skazenski. The interface can control the dampers in the HVAC ducts (also made by Loxone). Window sensors are also tied into the HVAC system to automatically activate a damper for a particular room when a window is opened. All of these actions are pre-programmed by Loxone in the default code, making it easier for integrators. to control lights, music and shades. Other features include a self-monitored fire and intrusion system, a third-party driver written to allow Amazon Alexa voice control, and water sensors. The panel that controls the smart home is a European-style DIN rail mounted system. On the entertainment side, the company also makes its own server, in-ceiling speakers, and a 12-channel amplifier. “We call it functional assurance because you can use all our own equipment. We are not a control system, but a true modern smart home built from the ground up,” says Woess. Last but not least, the Loxone Touch Surface turns any non-conductive material (tile, glass, wood, granite, etc.) into a control interface. In the show home, the actual countertop in the kitchen is a touch control device. Check out the slideshow of additional photos and information on Loxone's new smart home. This article was originally published at CEPro on 03/31/2018. It was added to IoTplaybook or last modified on 04/01/2018.